Pianist Ai-Ying Chiu Delights Steinert Hall with Selections from Piazzolla and Mendelssohn. by Sonia Deng and Kett-Chuan Lee. The trio played selections from “Four Seasons of Buenos Aires” by Astor Piazzolla, and the “Piano Trio in D Minor, Op. 49” by Felix Mendelssohn. 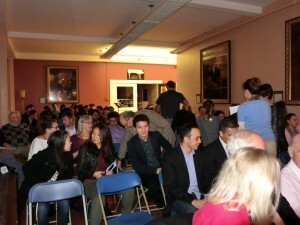 The well attended concert was followed by a wine and cheese reception. A truly wonderful evening overall! 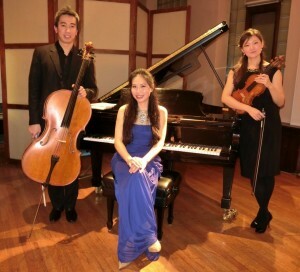 Ai-Ying has appeared as both soloist and chamber pianist at many important concert halls such as The Town Hall in New York City, Le Petit Trianon in San Jose, Walter Hall in Toronto, Basilica San Francesco in Assisi, Italy, Rachmaninoff Concert Hall in Tambov, Russia, Chih-Shan Hall of Chiang Kai-Shek Cultural Center in Kaohsiung City, Taiwan, and many others in Germany and France. In pursuit of her Master’s degree and Graduate Performance Diploma, Ai-Ying studied with Michael Lewin at The Boston Conservatory, where she was the winner of the H. Wilfred Churchill Piano Scholarship Competition in 2006 and the Piano Honors Competition in 2007 and 2009, and an Honorable Mention Award recipient in the 2008 Mozart Concerto Competition. She was also an Honorable Mention Award recipient at the 2008 Chinese International Piano Competition in New York City. Ai-Ying has worked and performed with Sinphonia Perusina, conducted by Enrico Marconi, and The Boston Conservatory Orchestra, conducted by Bruce Hangen. She has played in master classes given by Vladimir Viardo, Jorge Federico Osorio, Eric Larsen, Victor Rosenbaum, Jennifer Lim, Enrique Graf, Menahem Pressler, Anton Kurti, Kum Sing Lee, and many others.